Exhaust turbochargers consist of two flow machines; one turbine and one compressor that are placed on a joint shaft. The compressor draws in fresh air, which is then pressed through the charging air cooler for cooling down and then at up to 2 bar in the combustion chamber. The charging pressure then needs to be adjusted to the engine‘s operating conditions again. For that reason, the exhaust flow is forwarded with the use of the charging pressure control valve through the turbines into the exhaust plant. The turbocharger is balanced at 100,000 min-1 . and subjected to a hot gas test conducted at real operating conditions. Before replacing the turbocharger, the cause of the damage must be localised. What consequential damage was caused? Are foreign bodies or engine oil deposits in the suction channel? Clean suction channel, replace charging air cooler if required. Engine oil deposits in the charging air cooler may result in damage to the engine. Engine oil drawn in burns in an uncontrolled manner and the engine can rotate excessively. Subsequently, check the lubricant line for leakproofness and soiling. 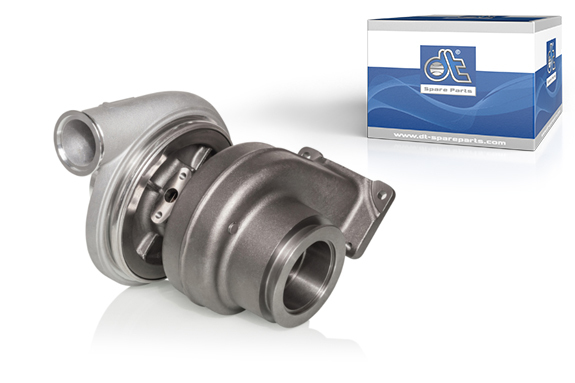 Adjust turbocharger to the assembly components, where applicable twist the housing and assemble with the seals provided. Finally, replace the engine oil and check the air filter, replace if required.